GPS Tracking (Google Latitude) Click on the link above to see where I am using Google Latitude (opens a new window). I will have daily updates starting May 10th. May 25, 2010: Canmore to Calgary. As I was biking out I looked behind and saw the Rockies. I gave them a salute goodbye thanking them for all the fun moments. Especially that 74 km/hr ride down Rogers Pass 🙂 This day has been the easiest ride so far. A few times going uphill I yawned not even bothering to change to my lowest gear. I was enjoying the clear skies and sunny day. My legs weren’t even sore when I arrived in Calgary. I thought to myself “it’s smooth sailing from here” 🙂 I definitely jinxed myself with that thought. 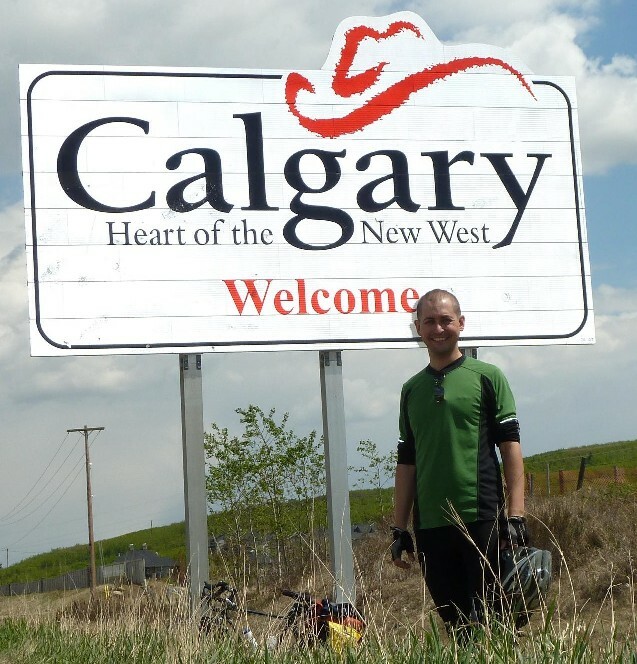 May 26, 2010: Calgary to Vulcan. Another easy ride? I was booking it out of the city for the 125 km trek to Vulcan. Heading South on Hwy 2 to High River was quick and painless. I did notice a little wind coming from the East. I didn’t think too much of it at first. Then when I started heading East my pace slowed to a crawl. Going at half the speed with only 46 km to go I realized it would take me just over four more hours to get there. The headwind frustrated me somewhat. Good thing I was in the middle of nowhere. No houses, no farms, no cars and no wildlife. No one would be able to hear me swearing loudly. After what seemed like an eternity I noticed on the horizon the intersecting roadway that passes through Vulcan. Given the flat terrain, I was guessing about eight more kilometres to go. Eventually I saw the town’s water tower just off in the distance. I considered it to be my beacon. Just keep on pedaling I thought and you’ll get there when you get there. I was 11 hours on the road to Vulcan from Calgary. Arriving late with rain in the forecast I could see the dark clouds creeping up to the town. I heard about the Vulcan Hotel with its theme rooms and decided to stay there for the night. I could not have picked a better place. Faye, the owner, gave me a tour of the rooms. There was the Safari room, Harley Davidson room, Sports room, Canada room, rooms dedicated to each province (the BC room had steps leading up to it, there was a draft in the Saskatchewan room and I would need to pay the HST for the Ontario room) and yes, there was the Star Trek room. 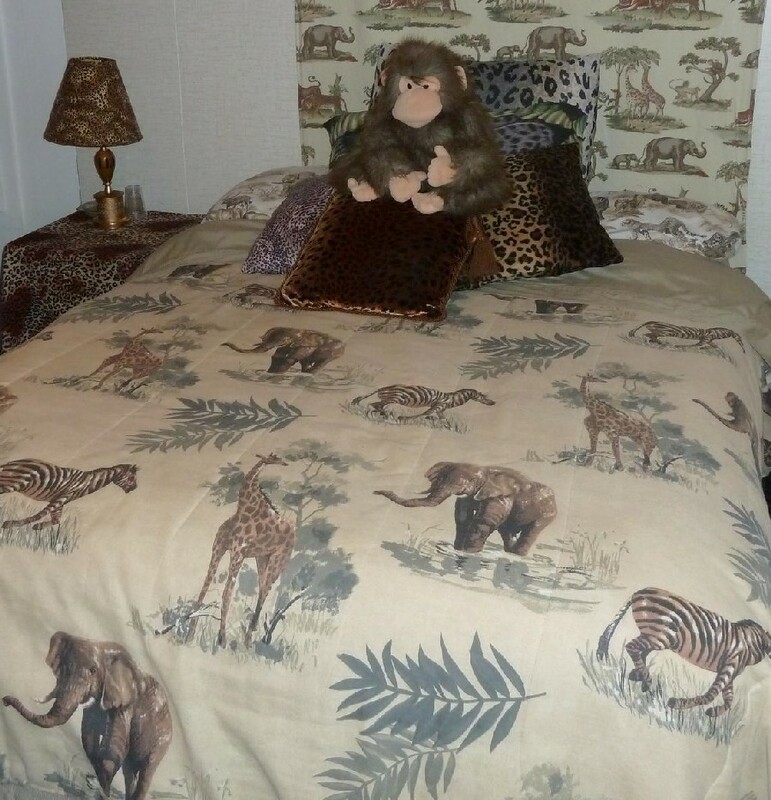 I chose the Safari room. Faye was an excellent host. I was in the town’s nerve centre. Everyone in the hotel bar were regulars who lived in Vulcan. If I had stayed at any other inn I would be with passerbys and wouldn’t get to really meet with anyone local. The topic of conversation included the rain scheduled for all night and into the next day and Leonard Nimoy, who had come to the town a month or so ago. A pasta dinner, a wine cooler and a shot of baileys for a nightcap beverage finished me off and it was time for bed. 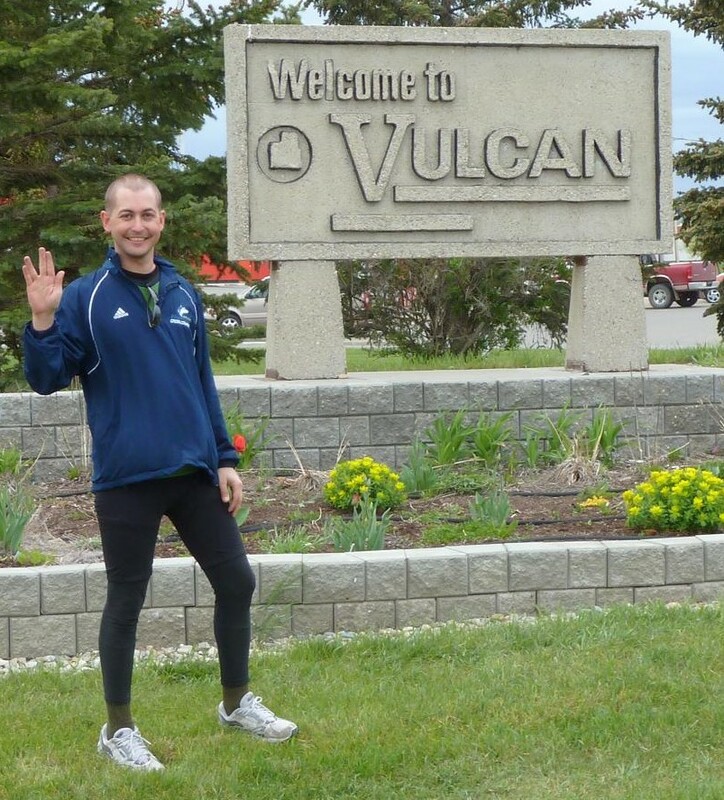 May 27, 2010: Vulcan to Lethbridge. I woke up to the tat tat tat sound of the rain. This would be my first full day of biking in wet weather. First things first, breakfast. Faye also runs a daytime restaurant that’s inside the hotel. Pancakes, sausages and a cafe mocha was on the menu. I took my time, procrastinating of sorts because of the weather. It gave me the opportunity to talk with the townsfolk who stopped in everyday for breakfast. Surprisingly Faye had called Steve, an editor from the Vulcan Advocate to come by and interview me. Apparently they don’t get a lot of people bicycling through town. Steve asked why I was bicycling across Canada, why I came to Vulcan and would I come back. With the last question I said “no” in the context of a bike. I wouldn’t come back on a bicycle since this is a one time trip. But if I drove across the country in a car, it’s definitely a place to revisit. They even have a new 18 hole golf course. I left Vulcan at 11:30 am for my 100 km ride into Lethbridge. It was snowing for the first half hour then turned into rain. The rain was to my left, the wind to my back and the road recently paved smooth for fast riding. Even though I was making good time I had to stop. I don’t have waterproof socks and my toes were starting to get really soaked and cold. Just 20 km into my ride I stopped at the Champion Inn to make up some waterproof socks. Obtaining four garbage bags from the owner (I didn’t get his name) I double layered them over a fresh pair of socks then taped them up around and around. MacGyver would be so proud. While I was there the owner asked me to proofread a speech he had just written. He was scheduled to attend a wedding in Toronto. It was a good speech. One thing that stood out was “success breeds success”. Back on the road it continued to rain. I had pulled out my fingers from the finger portions of my gloves and made a fist with them inside the palms to keep my hands from getting cold. My MacGyver socks held up most of the way. Not stopping for anything, it took me less than five hours to get to Lethbridge. May 28, 2010: Lethbridge to Taber. I woke up with a sore throat. The previous day’s weather did a number on me. 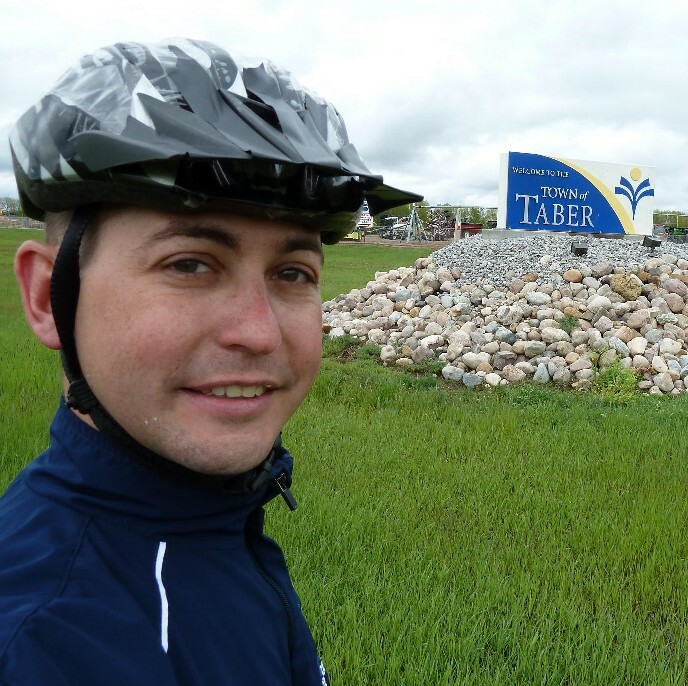 There was light rain in the forecast so I decided that I would bike a half day into Taber. As long as I’m moving forward I’m making progress. Before I left the city I went to a kayak store and purchased a pair of neoprene socks just in case the weather turned to worse. It was a slow ride to Taber, my mind just wasn’t into it. My bike creaked with every crank of my pedals as if sensing my own wear and tear and following suit. We both needed a rest. Upon arrival I picked up some garlic to help my immune system, drank plenty of fluids, then off to an inn where I cleaned my bike and settled into a warm bed for a long restful slumber. Off I went for my 120 km ride to Medicine Hat biking through snow and slush on the ground. Eventually it let up just a tad. The sun was working hard to pierce through the heavy clouds. I could see a tiny speck of light reflecting on the wet road in front of me. Not stopping for a break, I only occasionally pulled out my water bottle from my bike frame to drink while riding. I kept my bike in high gear most of the way determined to get to Medicine Hat. May 30, 2010: So long Alberta. I’m off to Saskatchewan. Please make cheques payable to Griffin Centre and address the envelope to "Going the Distance for Mental Health"
• Help support some of the most vulnerable, disenfranchised youth in our community. Our programs enable individuals who would not otherwise have the opportunity or the skills, to participate in a structured socialization, recreation, life, employment skills program to prepare them for further work experiences and successful community living. My other personal blog: Am currently living on an Adriatic Island and am blogging and tweeting about my experiences there. Urbane Cyclist Toronto-based specialist in bikes and accessories.